The following NHL Trophies will be available for viewing at the Lay's NHL All-Star Jamboree from Thursday through Sunday at the parking lot across from Bell Centre and Windsor Station in Montreal. "The trophies will be split in their display location," Nicholas Gennarelli, the NHL's Manager of Events & Entertainment, told NHL.com. "Some trophies will live in the 'Main Tent' in the parking lot across the street from the Bell Centre and the remaining trophies, including the Stanley Cup, will be on display at Windsor Station." Entrance to both Windsor Station and the 'Main Tent' are included in the $10 ticket cost, with a portion of ticket sales benefiting Hockey Fights Cancer charities in the Montreal area. Do you think you have a harder shot than Boston defenseman Zdeno Chara or a better glove hand than Anaheim goalie J.S. Giguere? There's only one way to find out and that's to join all the fun at the Lay's NHL All-Star Jamboree, the official fan festival of NHL All-Star Weekend and the 57th NHL All-Star Game in Montreal. The All-Star Jamboree will run Thursday through Sunday in the parking lot across from Bell Centre and Windsor Station. Tickets, which cost $10 Canadian, are allocated through two-hour time blocks to control the ingress of people into the event. "I'm really looking forward to this All-Star event," Nicholas Gennarelli, the NHL's Manager of Events & Entertainment, told NHL.com. "People were already talking about this All-Star event, two All-Stars ago in Dallas, so that translates to a lot of pressure on the NHL to deliver the best event experience to the city of Montreal and its fans." The All-Star Jamboree is home to the NHL Broadcast Center that will deliver live broadcasts from RDS, NHL Network and XM Satellite Radio, as well as other outlets. 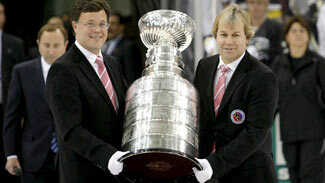 All 18 trophies from the Hockey Hall of Fame, including the Stanley Cup, will be on display throughout the Jamboree. -- Autograph sessions with NHL alumni. -- The opportunity to test hockey skills at the Honda NHL SuperSkills area. Included among the interactive games will be the McDonald's Hardest Shot, Gatorade Shoot & Score, Scotiabank Pass & Score, Cisco Be a Goalie, ConAgra Breakaway Challenge and the Bridgestone Accuracy Challenge. -- Picture opportunities with the NHL mascots. -- The NHL All-Star Trading Card and Memorabilia Show presented by Upper Deck and McFarlane Toys. -- NHL 2K9 station -- the first hockey video game made for the Nintendo Wii. -- Food and music provided by XM Canada's deejays. -- Official NHL All-Star merchandise for sale including the exclusive Saku Koivu McFarlane action figure available only at this event. Those fans with a ticket to the All-Star Jamboree will be able to take photographs with the Stanley Cup on Thursday, Friday and Saturday at Windsor Station. The Stanley Cup display will not be available to the public Sunday due to other private events. Fans are strongly advised to bring their own camera. "The Lay's NHL All-Star Jamboree began load-in on Jan. 10," Gennarelli said. "People don't often realize how much time and work goes into setting up these massive tent structures. There are crews working around the clock to make sure we open right at 2 p.m. on Jan. 22. "That said, I'm looking forward to the grand opening of the Jamboree and showing the city of Montreal that the NHL is in town. It should be a great start to the NHL All-Star Weekend." Artist David Arrigo, known for his signature Live Mural Experience, will be on hand at Windsor Station painting an All-Star legacy portrait of several Canadiens legends, including Patrick Roy, Ken Dryden, Saku Koivu, Maurice 'Rocket' Richard, Serge Savard, Bernie "Boom Boom" Geoffrion, Bob Gainey and Larry Robinson. This year's painting will feature Montreal goalie and Eastern Conference starter Carey Price as the central figure. Arrigo's mural will be donated and forever housed in the Sainte-Justine's Hospital in Montreal. Arrigo is always available to chat with curious bystanders as he works. "I'm gearing up for Montreal and looking forward to it since they'll also be celebrating 100 years of hockey," Arrigo said. "It's, without question, one of the most storied programs in the League and it's going to be a real honor." The Lay's NHL All-Star Jamboree is open Thursday (2-10 p.m.); Friday (2-10 p.m.); Saturday (10-10 p.m.) and Sunday (10-6 p.m.). On Sunday, a section of the Jamboree will be unavailable due to private events, so ticket prices will be reduced to $8. A portion of the proceeds from the All-Star Jamboree will go to Hockey Fights Cancer within the Montreal community. "We have tried to cater a little something for people of all ages," Gennarelli said. "For the young ones, we have created the Honda NHL SuperSkills Interactive Game where they can test their hockey skills. We have also created a new interactive area where kids can measure the size of their hand and foot against some of the NHL's top players." The League has also taken care of those older hockey historians who will be on hand. "For adults, we have autograph sessions with NHL alumni and current players, Hockey Hall of Fame artifacts and the NHL trading card show," Gennarelli said. "If you're a hockey fan in Montreal and want to be a part of the NHL All-Star Weekend, the Lay's NHL All-Star Jamboree is the place to be." WHEN: Thursday, Jan. 22, from 2 p.m. – 10 p.m.
Friday, Jan. 23, from 2 p.m. – 10 p.m.
• Drew Doughty / Los Angeles Kings from 4 - 5 p.m.
• Luke Schenn / Toronto Maple Leafs from 6 - 7 p.m.
• Steven Stamkos / Tampa Bay Lightning from 8 - 9:30 p.m.
Saturday, Jan. 24, from 10 a.m. – 10 p.m.
Sunday, Jan. 25, from 10 a.m. – 6 p.m.